In the pages of Coast Guard history are men and women committed to the achievement of the service’s goals. They exist to serve. One prime example is Lt. John A. Pritchard, Jr., from the U.S. Coast Guard Academy’s Class of 1938. Pritchard served as pilot of the Coast Guard Cutter Northland’s scout plane during the wartime Greenland patrol. At the start of WWII, Greenland was used as a strategic location for gathering reconnaissance of shipping routes and weather intelligence on the war zones in the North Atlantic and Europe. His aircraft was a Grumman J2F-4, a single-engine amphibious plane used in the 1930s and 40s by U.S. armed forces, mostly for air-sea rescues. In November 1942, the Northland received word that three Royal Canadian Air Force crewmembers were stranded on the 2,000-foot Greenland ice cap for 13 days. Pritchard led a rescue party using the cutter’s motor launch to come alongside the mountain wall, hike up the glacier and locate the stranded servicemen with shouts and flashlight signals. The searchers and rescued crewmen then made their way back to the cutter, in the dark, across the heavily crevassed ice. For his efforts Pritchard would later be awarded the Navy and Marine Corps Medal, posthumously. Less than a week later, he volunteered to fly to the rescue of an Army B-17 Flying Fortress bomber crew that had crashed on the frozen ice cap. Petty Officer 1st Class Benjamin Bottoms, a radioman aboard the Northland, volunteered to go with him. With its sudden violent storms, deep fissures and hidden crevasses, no one had previously landed a plane on the ice cap. From the decks of the Northland, the plane was lowered over the side of the ship and took off from the icy waters in an attempt to reach the marooned air crew. The rescuers flew low over the unforgiving terrain, using a weak radio signal to locate the crash site. Landing nearby, Pritchard and Bottoms made their way to the downed bomber, returning with two of the stranded crewmen. As the four squeezed into the small plane, Pritchard retracted the Grumman’s wheels by hand and as the plane slid across the ice and snow, he managed to get it in the air before landing safely back alongside the Northland. At first light the next morning, Pritchard and Bottoms returned to the site. As they headed back to the ship with an injured survivor, they sent a request for radio bearings but they were never heard from again. The partially buried wreckage of the Grumman was later spotted by aircraft that was unable to reach the downed plane. Over time the treacherous climate of the area engulfed the wreckage and to this day their bodies have never been recovered. The citation that accompanied the Distinguished Flying Cross awarded for his last rescue highlighted, “courage, skill and fearless devotion to duty,” that have been recounted in various texts, perhaps most recently in the book, “Frozen in Time” by Boston University professor Mitch Zuckoff. Now nearly 72 years later that courage, skill and fearless devotion to duty are being honored and respected by a new generation. 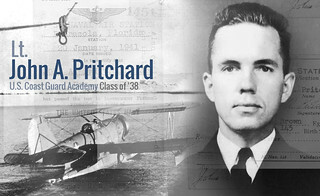 At the Academy, in the brilliant sunshine of an autumn day, Lt. John A. Pritchard, Jr., was being remembered. On the same campus where he once stood at attention as a cadet, Pritchard was inducted into the Hall of Heroes by the Corps of Cadets. The annual event helps cadets learn of the selfless acts others have performed as officers, and serves to build and maintain the culture of the service. Visit these links for historical information about Pritchard and a slideshow presentation from the Hall of Heroes inductee ceremony Nov. 7, 2014.